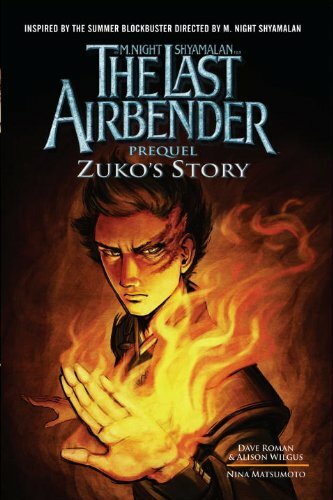 Order ‘The Last Airbender: Prequel: Zuko’s Story’ by Alison Wilgus, available from Amazon.com by clicking on the book cover above! Apparently, Aang is knocking at the door and I’m in danger of being besieged—by teenage girls. Oh, the humanities!!! Seriously, it’s not that bad. You can LISTEN to this interview with DAVE ROMAN and ALISON WILGUS, co-authors of THE LAST AIRBENDER: PREQUEL: ZUKO’S STORY, by clicking the audio player above! Of all the questionable cartoons Rachel has watched over the years, “Avatar: The Last Airbender” on Nickelodeon has been one with which I’ve never taken issue on content or quality. This Japanese anime import has impressed many parents with its quality stories, humor and humanity. It’s never been a source of mindless violence or sexploitation that is often rife in the genre. On Thursday, July 1, the story of Aang—the young boy with the unmistakable arrow on his head—comes to movie screens as a 3-D flesh-and-blood story by M. Night Shyamalan and effects straight out of The Matrix movies. Joining me today are Dave Roman and Alison Wilgus, who have written two graphic novels—manga, if you will—featuring Aang, The Last Airbender. The first is a prequel, Zuko’s Story, illustrated by Nina Matsumoto; the second, an adaptation inspired by The Last Airbender film and illustrated by Joon Choi. Avatar: The Last Airbender – The Complete Series. Order your copy now by clicking on the DVD box set above!